Great-looking and powerful, but is it worth the money? 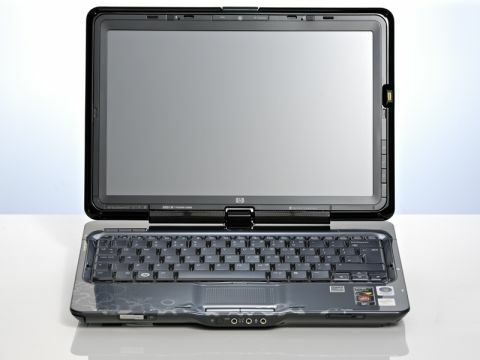 The first thing that strikes you about the HP dv6-1240ea Entertainment PC is how well finished it is. HP has once again used its imprint technology to produce a glossy and very attractive notebook – an effect that extends to the touch media controls and the flush ports on the side of the notebook really do look the part. But the aesthetics aren't all good; the keyboard is a little spongy for our liking and the glossy trackpad and mouse buttons, while fairly firm to the touch, aren't exactly ideal. The laptop is surprisingly lightweight and it certainly feels less than the cited 2.88kg. It's incredibly light for something so large and we're genuinely impressed by that; you think looking at the machine that it will be a bit beefy, but it's simply not. Although £699 may seem like a hefty price point, the difference in quality between a £400 notebook and the Pavilion is quite staggering. So what you get for your extra £300? Well, as well as the far better feel and finish of the HP, you also get a pretty impressive specification. There's a 2.1GHz Intel Core2 Duo processor powering things along, 4GB of memory and a 500 GB hard drive - plenty to store all your photos, music and video to boot. Crucially, you also get dedicated graphics in the form of the ATI Mobility Radeon HD 4530 card for enhanced HD video playback and gaming. As well as the little standard extras such as a webcam, memory card reader and Lightscribe dual layer DVD burner, plus other bits and pieces such as the HDMI port and remote control. There's also a number pad for work use. As seems to be the way with most laptops shipping today, HP has supplied a lot of extra software with the system including bespoke HP apps and Norton security software. This creates its own problems, however. On the first startup, the system took a good five minutes to initialise while the software was installed. This immediately filled us with dread; when manufacturers place lots of software on their systems performance is rather slow and disappointing. HP's Total Care Centre then pops up inviting you to register. It may enable HP to ship out updates and product information, but it's certainly it's not what you expect when you start up a PC for the first time. It's no wonder people like Google want to make the PC experience simpler. Overall though, the HP is a fantastic laptop for use as an entertainment hub. It's powerful and smart, while its lack of weight means it's an ideal living room machine.